Comic-Con News: The Namco Bandai-backed ShiftyLook announced its first two Web animated series as well as three new Webcomics at the "ShiftyLook" panel on Saturday. 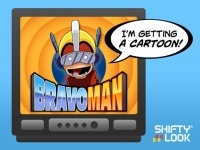 The first animated series announced was Bravoman: Cartoon of Unequaled Excellence, which adapts the first ShiftyLook Webcomic to the animated medium. Scott Kurtz (of PvP Online fame) is directing the second ShiftyLook animation project, Mappy: The Beat, which is written by Kurtz and Kris Straub. The protagonist of Mappy is a beat cop whose job is keeping tabs on deadbeat, washed-up video game characters. ShiftyLook also announced three new Webcomics for its revamped site including Dragon Spirit, an adaptation of the 1980s vertical scrolling arcade classic. Written by Erik Ko and Jim Zub with art by Steven Cummings, Dragon Spirit is a comedic sword and sorcery adventure that will debut on ShiftyLook in September. Chris "Elio" Eliopoulos is both writing and drawing Golly! 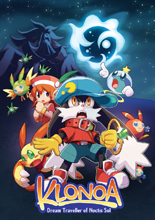 Ghost!, which adapts the 1990 cult classic arcade shooter game in a Webcomic that debuts this month, while Jim Zub collaborates with manga artist Hitoshi Ariga on Klonoa, a vintage game-inspired Webcomic that will debut on the ShiftyLook site in August.